In the words of Roger Dangerfield, introverts can say “I don’t get no respect.” In North American culture extroversion is rewarded and favoured and introversion seems to be regarded as something to be cured. There has been a noticeable shift from the days when “solitary flights of thought” as Cain puts it, had higher value. She points out how things have changed and the value is now towards more interaction, which is not always helpful for introverts. In schools, desks used to be in rows, now they are in pods with students facing each other. In the workplace, where there used to be individual offices, now there are open style cubicles. Group work is encouraged and team projects are often the norm. People are encouraged to speak up and take initiative. No one is saying that extroverts can’t be shy and introverts aren’t social; we generally know that it has more to do with how one recharges. Introverts need to restore and recharge on their own, and extroverts need to recharge with others. In this powerful and long overdue book Cain does a great job of defining just what an introvert and an extrovert are, and how that affects how people live and work. There is not one better than another, they are just different. But the power of introvertism has been somewhat overlooked and Cain definitely shows how success and brilliance can come from both types and indeed always has. Her research is thorough and her findings are profound. She also explores different cultures and points out that some other parts of the world are not quite so pro-extrovert as North American and Europe have become. Even if you know you are an extrovert, this book can be of interest to you. Since a third to a half of all people are introverts, chances are you are married to, or work with, or are related to an introvert. This book will raise awareness and go a long way towards a better understanding and sensitivity within relationships. Cain mustered up the courage to do a TED talk, to get her message out there. Since she is an introvert, this was a challenge for her, but as she points out in her book, when introverts are passionate about something they can excel at public speaking and engage in more extroverted behaviour. The link to her TED talk is just below. The book goes into more depth but her main points are in the talk. This entry was posted in Four Star, Non-Fiction and tagged introverts, Quiet, Susan Cain, TED talks. Bookmark the permalink. Thanks for this review. Look forward to watching the TED talk… extrovert that I am, I’m too distracted to read her book :-). I very much enjoyed this book and thought it did a great job of presenting much research about introverts, but as an introvert myself I think it missed part of the whole picture. 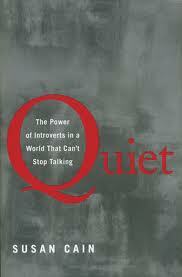 The author strongly emphasizes being QUIET when I just don’t think all introverts are that way. Some, such as Steve Martin, can be quite talkative, dramatic, and gregarious in the right settings and don’t have fears of public speaking such as the ones the author wrote so much about. I loved this book. It is so nice to have someone cheering for the other team! I was able to relate to so much of what she wrote about and really found her charming in her TED presentation. Excellent book, very good writing and well researched. You’ve awesome info on this website.